I made this for a Convention Christmas Card Swap. I used the Beautiful Season stamp set and then used the AquaPainter to color it. Ink colors are: Gumball Green, Cherry Cobbler, Basic Gray, Crumb Cake, Soft Suede, and More Mustard.﻿ I added some Be of Good Cheer Designer paper and Cherry Cobbler seam binding ribbon. The background Gumball Green cardstock was run through the Petals-a-Plenty Embossing Folder then I put dots of Champagne Mist Shimmer Paint in the centers of the flowers. 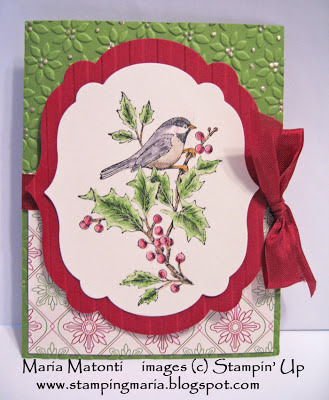 The Very Vanilla and Cherry Cobbler cardstock pieces were cut using the Labels Collection Framelits. After I assembled the entire card, I sprayed it with Champagne Mist Shimmer paint mixed with 70% rubbing alcohol for some great shimmer and shine (too bad you can't see it in the picture)! HAVE A GREAT CHRISTMAS EVE WITH YOUR FRIENDS AND FAMILY! See you tomorrow for a fun SU video.